Willow tree bark, which is used to make aspirin, is toxic to cats and dogs -- particularly cats. Willow trees aren't usually a source of cat and dog poisoning, but medicines derived from their bark -- aspirin, most notably -- can be quite toxic. Cats, who lack the ability to process the salicylic acid found in willow tree bark and aspirin, are particularly prone to toxic exposure. Willow trees are a fast-growing species of deciduous trees often found near streams in temperate, cooler parts of Eurasia and North America. Their bark has been used as medicine for thousands of years, primarily because of its pain relieving and anti-inflammatory effects. Willow tree wood isn't necessarily toxic to cats and dog. Its bark, however, can be poisonous, particularly to cats. Keep your pets away from willow trees, and don't let them claw or chew on willow tree limbs. 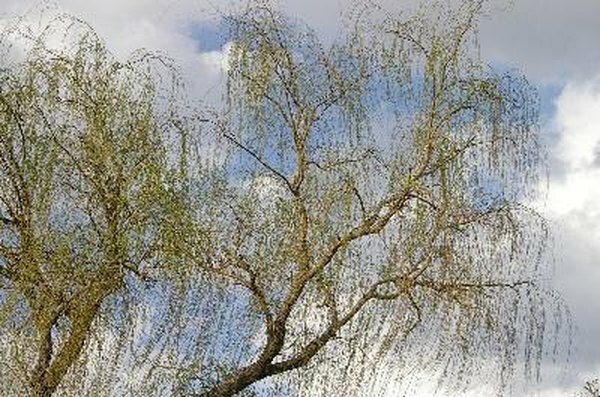 The toxic component of willow tree bark is also its medicinal component -- salicylic acid -- which is utilized in commercial aspirin products. Cats lake the enzymes necessary to process salicylates. These chemicals can easily build up to toxic levels in their bodies. The affects are both acute and cumulative. Dogs suffer ill effects with acute exposure to salicylates, although this more common with the accidental ingestion of aspirin than willow tree bark proper. Puppies and developing dogs may not be able to process salicylic acid, much like their feline brethren. Willow poisoning can take time to manifest, although symptoms, once initiated, can progress quickly and usually involve the stomach. Loss of appetite usually comes first. Next comes vomiting, diarrhea and intestinal hemorrhage, the last of which is because of stomach and small intestine ulceration. Your pet may stumble or appear weak and uncoordinated as his central nervous system reacts. Loss of consciousness and sudden death are also possible, particularly in cats. If you suspect your pet has eaten or chewed on willow tree bark, call a veterinarian. The same goes for aspirin. In the case of the latter, you may be advised to induce vomiting. Veterinary use of willow tree bark is unusual, but derivatives like aspirin ares occasionally used to treat conditions like arthritis and associated joint pain. Follow your veterinarian's advice and label instructions carefully. Medications intended for humans -- even those formulated for children or infants -- may have levels of certain ingredients that are toxic to cats and dogs. Willow tree bark derivatives are no different in this regard. Cats can tolerate 10 milligrams of aspirin every two days. Dogs can tolerate 30 milligrams of aspirin per pound of body weight per day. Even at therapeutic doses, some animals display sensitivities that preclude their use. Are Nuts Poisonous to Cats? Is Hemlock Bark Bad for Dogs?